Chapter 1 updates Mobile WiMAX status and standards; Chapters 2-6 are related to physical layer transmission; Chapters 7-12 deal with MAC and networking issues; Chapters 13-14 discuss relay networks for mobile WiMAX; and Chapters 15-19 present multimedia networking for mobile WiMAX and application scenarios. Professor. Kwang-Cheng Chen is a Professor at Institute of Communication Engineering, College of Electrical Engineering, National Taiwan University, Taipei, Taiwan, ROC, and is an Irving T. Ho Chair-Professor. He received a BSc from the National Taiwan University in 1983, MSc and PhD from the University of Maryland, College Park, United States, in 1987 and 1989, all in electrical engineering. From 1987 to 1991, Dr. Chen worked with SSE, COMSAT, and IBM Thomas J. Watson Research Center in mobile communication networks. Professor J. Roberto B. de Marca received his undergraduate engineering degree from the Pontifical Catholic University in Rio de Janeiro, Brazil. Prof. de Marca was a Fulbright Scholar at the University of Southern California, where he earned a Ph.D. in Electrical Engineering in 1977. He then joined the faculty of the Catholic University, Rio de Janeiro, Brazil, where he has held several positions including Associate Academic Vice President for Sponsored Research. In 1990, Prof. de Marca was appointed, by the Minister of Science and Technology, Scientific Director of the Brazilian National Research Council (CNPq), responsible for a 300 million dollar research funding program which included all individual research grants and fellowships in all areas of knowledge. 1 Introduction to MobileWiMAX (Longsong Lin, and Kwang-Cheng Chen). 1.3 IEEE 802.16e Mobile WiMAX. 1.4 Mobile WiMAX End-to-End Network Architecture. Part One Physical Layer Transmission. 2 An Analysis of MIMO Techniques for MobileWiMAX Systems (Bertrand Muquet, Ezio Biglieri, Andrea Goldsmith, and Hikmet Sari). 2.3 M Multiple Antennas in WiMAX Systems. 3 Mitigation of Inter-Cell Interference in MobileWiMAX (Jae-Heung Yeom and Yong-Hwan Lee). 3.3 Combined Use of ICI Mitigations in Mobile WiMAX. 3.4 New ICI Mitigation Strategy in m-WiMAX. 4 Overview of Rate Adaptation Algorithms and Simulation Environment Based on MIMO Technology in WiMAX Networks (Tsz Ho Chan, Chui Ying Cheung, Maode Ma and Mounir Hamdi). 4.2 WiMAX Physical and MAC Layer Description. 4.3 Research Issues on the MIMO-based Rate Adaptation Algorithms. 4.4 Constructing a Practical Rate Adaptation Simulation Model for Mimo-Based WiMAX Systems. 5 Phase Noise Estimation in OFDMA Uplink Communications (Yi-Ching Liao, Chung-Kei Yu, I-Hsueh Lin and Kwang-Cheng Chen). 5.2 Modeling of Phase Noise. 5.3 Phase Noise in OFDM. 5.4 Phase Noise in OFDMA. Part Two Medium Access Control and Network Architecture. 6 OptimizingWiMAX MAC Layer Operations to Enhance Application End-to-End Performance (Xiangying Yang, Muthaiah Venkatachalam, and Mohanty Shantidev). 6.2 Overview of WiMAX MAC features. 6.3 Asymmetric Link Adaptation for TCP. 6.6 Other MAC Layer Optimization Techniques. 7 A Novel Algorithm for Efficient Paging in MobileWiMAX (Mohanty Shantidev, Muthaiah Venkatachalam, and Xiangying Yang). 7.2 Overview of Idle Mode and Paging Operation in Mobile WiMAX Networks. 7.3 Proposed Paging Algorithm for Mobile WiMAX Networks. 8 All-IP Network Architecture for MobileWiMAX (Nat Natarajan, Prakash Iyer, Muthaiah Venkatachalam, Anand Bedekar, and Eren Gonen). 8.2 WiMAX Network Architecture Principles. 8.4 MS Session Control Procedures. 8.6 QoS and Policy Architecture. 8.7 Network Discovery and Selection. Part Three Multi-hop Relay Networks. 9 Aggregation and Tunneling in IEEE 802.16j Multi-hop Relay Networks (Zhifeng Tao, Koon Hoo Teo, and Jinyun Zhang). 10 Resource Scheduling with Directional Antennas for Multi-hop Relay Networks in a Manhattan-like Environment (Shiang-Jiun Lin, Wern-Ho Sheen, I-Kang Fu, and Chia-Chi Huang). 10.2 System Setup and Propagation Models. 11 Efficient Radio Resource Deployment for MobileWiMAX with Multi-hop Relays 1(Yong Sun, Yan Q. Bian, Andrew R. Nix, and Joseph P. McGeehan). 11.2 System Performance and Enhancement. 11.3 Effective Efficiency of Multi-hop Relaying. 11.4 Relay Efficiency without Radio Resource Sharing. 11.5 Relay Efficiency with Radio Resource Sharing. 11.6 Directional Distributed Relay Architecture. 11.7 Case Study of Radio Resource Sharing. 12 Dimensioning Cellular Multi-hop WiMAX Networks (Christian Hoymann and Stephan Gobbels). 12.1 Dimensioning Cellular 802.16 Networks. 12.2 Dimensioning Cellular Multi-hop 802.16 Networks. Part Four Multimedia Applications, Services, and Deployment. 13 Cross-Layer End-to-End QoS for Scalable Video over MobileWiMAX (Jenq-Neng Hwang, Chih-Wei Huang, and Chih-Wei Chang). 13.3 Mobile WiMAX QoS Provisioning. 13.4 The Integrated Cross-Layer System. 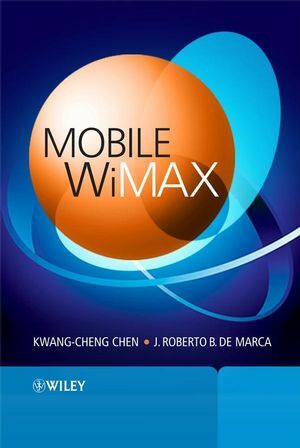 14 WiBro – A 2.3 GHz MobileWiMAX: System Design, Network Deployment, and Services (Hyunpyo Kim, Jaekon Lee, and Byeong Gi Lee). 14.3 ACR (ASN-GW) System Design. 14.4 RAS (BS) System Design. 15 A New WiMAX Profile for DTV Return Channel and Wireless Access (Luıs Geraldo Pedroso Meloni). 15.2 A Brief History of the SBTVD-T.
15.3 WiMAX as Return Channel for DTV. 15.4 WiMAX-700 Advantages and RC Application. 15.7 WiMAX-700 Capacity Simulation for Interactive DTV. 16 A Packetization Technique for D-Cinema Contents Multicasting over MetropolitanWireless Networks (Paolo Micanti, Giuseppe Baruffa, and Fabrizio Frescura). 16.2 Technical Specifications for D-Cinema. 16.5 Test Application and Results. 17 WiMAX Extension to Isolated Research Data Networks: The WEIRD System (Emiliano Guainella, Eugen Borcoci, Marcos Katz, Pedro Neves, Marilia Curado, Fausto Andreotti, and Enrico Angori). 17.2 Novel Application Scenarios for WiMAX. 17.5 Validating Results: Four European Testbeds. 18 Business Model for a Mobile WiMAX Deployment in Belgium (Bart Lannoo, Sofie Verbrugge, Jan Van Ooteghem, Bruno Quinart, Marc Casteleyn, Didier Colle, Mario Pickavet, and Piet Demeester). 18.2 Technical and Physical Aspects of Mobile WiMAX. 18.3 Technical Model and Planning Tool. 18.5 Economic Results for a Mobile WiMAX Rollout in Belgium.